WGD completed the fit-up and amalgamation of the Ontario Court Justice (OCJ) Office for the Ontario Ministry of the Attorney General (MAG). 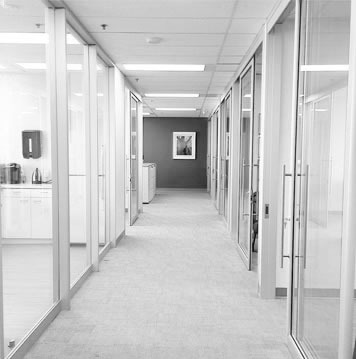 When WGD was first engaged to work on the project, OCJ occupied two suites on two separate floors at 1 Queen Street East. It had therefore been a longtime goal of the ministry to amalgamate the entire branch into one suite in order to facilitate communication and internal operations. In late summer 2015 an adjacent suite on the 23rd floor was vacated by another ministry and available for OCJ's office amalgamation. WGD completed the renovation of that vacant 2,700 square feet on the 23rd and relocated all staff from the 8th floor, pulling back all existing cabling, electrical, and prepping the surfaces to base building standards in order for the former suite to be ready for a future tenant lease. In addition to the expanded space, renovations were completed to an existing occupied OCJ space to allow for the creation of a new boardroom and library. Construction began in September 2015 and was substantially complete in December 2015. WGD oversaw the specification and tendering of new modern systems furniture. Lawyers' private offices and shared spaces were configured with full-height demountable glazed partitions and sliding glass barn doors to maximize light and take advantage of the building's expansive Toronto views. This project was completed under the Government of Ontario's VOR program.